Butterfly Bench for your patio or garden . Special. This magnificent garden bench comes in Verdi or Periwinkle. Measures 36-inches D X 74-inches W X 53-inches H. It is a striking piece made out of hand crafted 1/4-inch steel. The bench is fabricated, shot blasted, flame sprayed with zinc, and painted with a high quality two part epoxy base paint. This weather proof finishing technique results in a highly resistant coating that prevents oxidation. It is individually hand painted using a dry brush technique or air brushed. Minimal maintenance - wash with mild soap and water. This designer bench can be used in a sun room or outside garden. 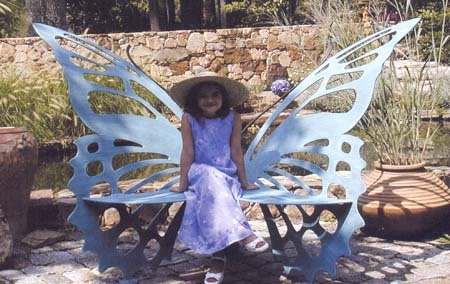 Everyone loves this bench when they see it especially for the collector of butterflies. Comes in a smaller size and a larger one as well call for price quote if interested. This bench will go in as U.P.S on checkout of the cart however it ships common carrier due to its size and weight which is over 150 pounds and is oversized. There is also a matching butterfly table, please call or write for further pricing. Weather proofed for snow or seaside, easily cleaned with soap and water. Made in the U.S.A. This Magnificent Bench can be passed passed down for many generations to come. We personally have sold it to Parks, Butterfly Gardens and Memory Benches instead of using Stones. We can also order Plaques or Names on this bench or any of our benches please call for pricing and additional pictures and info. This bench is non refundable except if manufacturers defect which has never happened as they are custom made with great care and detail. Thanks For Shopping .